The CW's hit series The Flash returned to kick off the back half of Season 2 last week with Potential Energy. Just a few weeks before this episode debuted, it was confirmed that actor Robbie Amell will return, although he will be playing a much different character. His role, Ronnie Raymond, was one half of Firestorm, but the character was killed in the Season 1 finale back in May. ComicBook.com reports that the actor appeared at a Q&A session at Heroes and Villains Fan Fest in New Jersey, where he revealed exactly when Deathstorm will debut, along with another huge tease. Of course, the actor wouldn't reveal exactly what character he'll kill in this upcoming episode, but it's worth noting that, after the introduction of the multiverse at the end of last season, we could certainly see this character again with their Earth-2 version. We'll find out in just a few short weeks who the actor's villainous character will kill, so stay tuned for more updates. Robbie Amell's return was teased last month when the actor posted two cryptic photos, one with his co-star Victor Garber, who will be a series regular on the spinoff DC's Legends of Tomorrow along with Franz Drameh, and another featuring his Firestorm/Deathstorm suit. In the DC Comics, Ronnie was brought back to life as Deathstorm during the Blackest Night event, when he became a member of the Black Lantern Corps. Interestingly enough, in the comics' Earth-3, Martin Stein himself is actually Deathstorm, but it isn't known if we'll see that transformation on the show yet. Last month, a new trailer for the remainder of Season 2 revealed a new glimpse of Earth-2's Caitlin Snow, a.k.a. Killer Frost (Danielle Panabaker). Ronnie and Caitlin were married on Earth-1, and this report reveals that they are also a couple on Earth-2 as well, both described as a "force to be reckoned with." It is believed that Barry Allen (Grant Gustin) and his team will be journeying to Earth-2 later this season, where they will surely meet up with Killer Frost and Deathstorm. Unfortunately, we don't have a specific date regarding when Deathstorm will make his debut quite yet. The Flash returns with the midseason premiere episode Potential Energy, was followed by two half-hour specials, one featuring the upcoming spinoff DC's Legends of Tomorrow, which debuted Thursday, January 21, and another entitled DC Films Presents: Dawn of the Justice League, which will feature the world premiere of the new trailer for the upcoming feature film Suicide Squad. 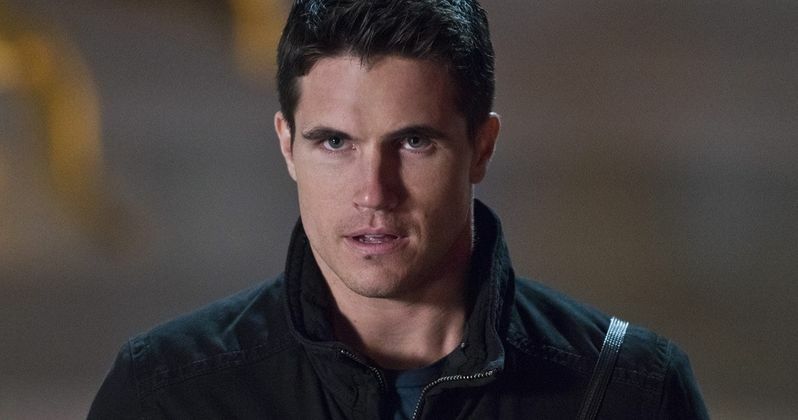 What do you think about Robbie Amell's return to The Flash as Deathstorm?